The fastest growing segment amongst car buyers these days is the Crossover/SUV, especially the compact and mid-size jobs. They seem to be the ‘family car’ of choice for Mums and Dads with buggies and weans and other such essential paraphernalia. So if ‘new’ auto manufacturing companies want to make a mark quickly, then best to get one of these on the road to tempt the discerning great British public. So for the old hands who remember what MG once was, and once stood for, the ZS is not what you would expect. This is as far removed from a low-slung, flies in the teeth, open topped two seater as you could get with a sophisticated high riding, roomy four seater SUV styled saloon car clamped on to the back of a very familiar badge. However, just producing any old SUV isn’t enough to cut the mustard. 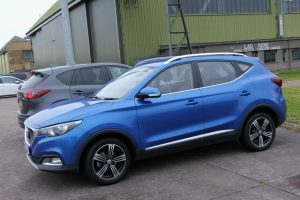 This segment is so fiercely contested with a bewildering range of excellent vehicles that ‘good enough’ isn’t just going to cut it. Anyone who produces a vehicle in this sector will have to make sure it is good. That means stylish, comfortable practical, reliable and roomy. 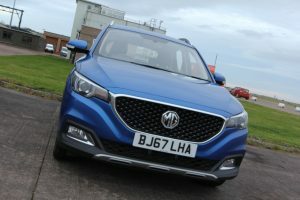 The MG team therefore had a big job on their hands with their first SUV offering. After driving the new ZS, the verdict is distinctly positive. In fact a couple of folk wanted a closer look when it was parked at Leuchars for the Kingdom Rally. It’s always nice to get a second opinion, eh? There are just two engine options, a 105bhp 1.5 litre four cylinder petrol with 5spd manual gearbox and a 109bhp 1 litre turbo triple with 6sp auto. There are no diesels in the line-up and it doesn’t look as though there is likely to be one – a sign of the times, eh? There are no plans either for a four wheel drive version. What you get is a front wheel drive roomy saloon that rides well, just don’t expect any fireworks. There is little to choose between the engine options power-wise, but the triple does rev higher and pull better than the normally aspirated 4 cylinder job. Although the auto ‘box has 3 modes for Normal, Urban and Dynamic, the end result doesn’t make much of a difference and most folk will just leave it in Normal mode and forget about the others. That’s not a criticism, just a reflection on who is likely to buy the car and how it will be used. With that in mind, creature comforts will figure highly on the list of reasons to buy. And this is where the ZS will score highly. It really is well equipped for the money. 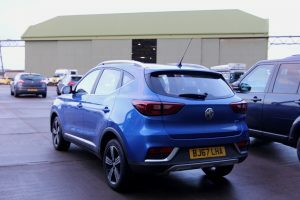 The ‘Explore’ entry-level models get LED day-running-lights, electrically adjustable door mirrors, projector headlights and 15in alloy wheels as standard on the outside. Inside there are manually adjustable front seats, air conditioning, cruise control and USB and Bluetooth connectivity. Step up to ‘Excite’ spec and the DAB radio has Apple CarPlay, plus it also comes with climate control, heated wing mirrors, front foglights and 17in alloys. The range-topping ‘Exclusive’ gets rear parking sensors, leatherette upholstery and a reversing camera. 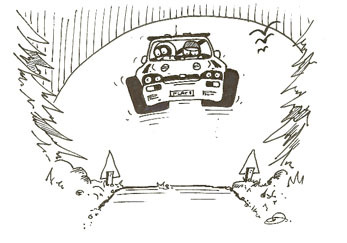 The other big attraction for a family runabout is the space. The boot is pretty big while the back seats offer sufficient leg and head room for rapidly growing teenagers. Clinching the deal has to be the price. The base model sells for £12,495 while the top spec offering comes in at £17,495. That’s pretty good for what you get, but there’s more. The MG comes with a 7 year Warranty. OK, the quality of fit and finish leaves a little to be desired, but if you want a better looking interior you’re going to have to spend a lot more on another brand. The MG ZS undercuts most of its class rivals quite considerably and that is its biggest selling point. If you need space and comfort on a budget, then it’s hard to beat. I actually quite liked it.